Astley and Berry joined forces on Astley’s song “Beautiful Life” from his new album of the same same. It’s not exactly clear where the idea for the performance came from. Earlier that day, Astley tweeted a photo with Berry saying he’d “bumped into” her, but not hinting that she’d later join him onstage. Meanwhile, festival organizer Rob da Bank later shared this snippet of Astley and Berry in rehearsal, calling their team up one of the “odder moments” of the weekend. Though Berry left The Great British Bake Off in 2016, American viewers can still catch her on TV every Friday night as PBS airs an early season of the cooking competition series (dubbed The Great British Baking Show in the States). 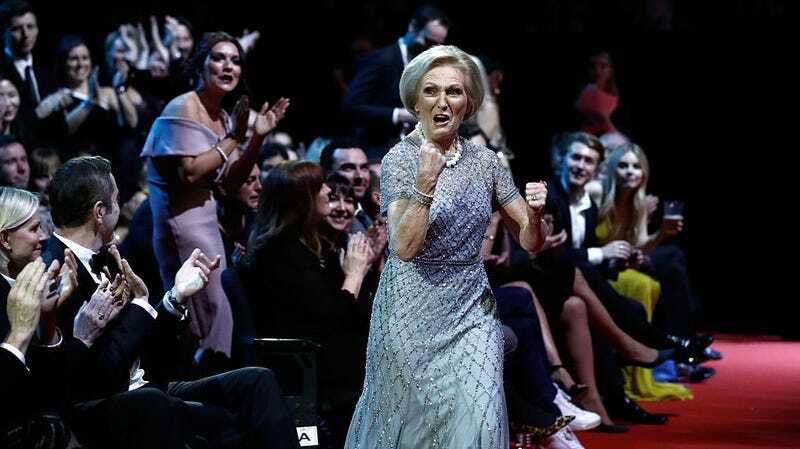 And her musical performance is just further proof that while her co-judge Paul Hollywood may style himself as the bad boy of GBBO, Mary Berry is the true badass of the series. And for his part, Astley may have finally found something to rival Rickrolling: Mary Berrying.